I have never read Mary Shelley's Frankenstein, nor have I seen the classic Universal film of the same name. Despite this, I've read quite a few comics of late that have featured the famed monster. It's a fascinating character when you get down to it. Here's a creature that is a gross amalgamation of other people, put together by a mad scientist, and brought to life to spite nature. Then when he's able to think for a moment, he's labeled a beast and alienated from society leading to a murderous rage and ultimately his quest for his own death. 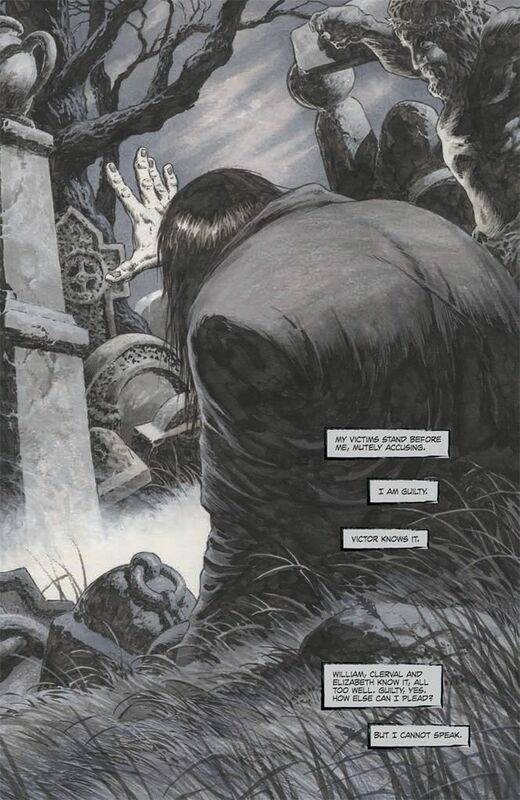 In Frankenstein Alive, Alive!, Steve Niles and Bernie Wrightson have picked up the creature's story after he was left in the cold near the North Pole. This is a comic that has been in the works for some time. This third issue was released months after the previous two. It was long enough for Niles to release an entirely different comic featuring Frankenstein's creation, entitled Monster & Madman. Fortunately, IDW Publishing has repackaged the first two issues in a “Reanimated” edition to get you up to speed quickly before diving into the new chapter. When we last left the creature, he had taken up residence with eccentric Dr. Ingles, spending countless hours learning from the man and reading in his library. He grew so comfortable that he was able to forget for a moment that he does not look like a normal human and his appearance deeply frightens normal folk. This leads to a fatal injury of Ingles' wife Dolly when she sees the monster and faints. The doctor sends away all of his staff except for a young pregnant woman in an effort to concentrate on his wife. What slowly becomes apparent in this issue is that “Frank” is not the only monster here. It creeps up on you, but when you realize Dr. Ingles' true intentions, it makes Frankenstein's creation look like a teddy bear. This is what true evil looks like. What really stands out throughout Frankenstein Alive, Alive! is the creature's tortured life. He's haunted by the murders he's committed and he's been ready to face the death he feels he deserves, but it will not come. He now struggles with the concept of life and death in a world where he's seemingly immortal while the people around him are so very fragile. Meanwhile, deep down he has a gentle soul that is the farthest thing from a monster. 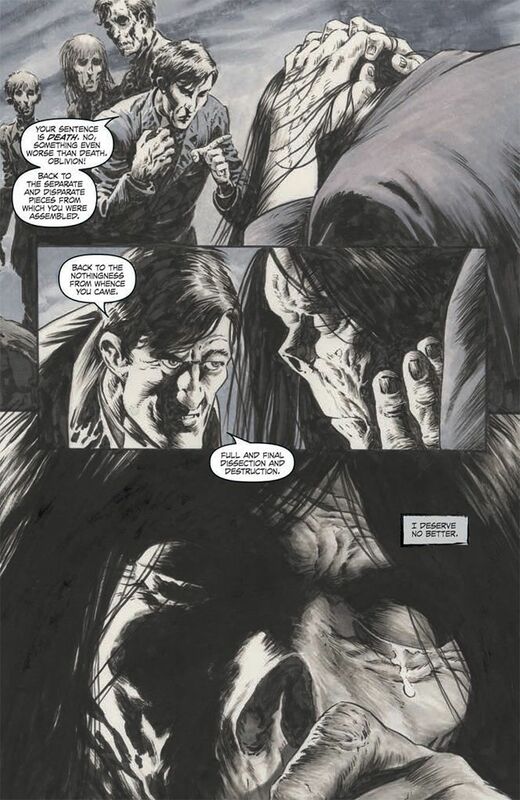 Niles is a big name in the horror comic industry on his own with titles such as 30 Days of Night and Criminal Macabre under his belt. 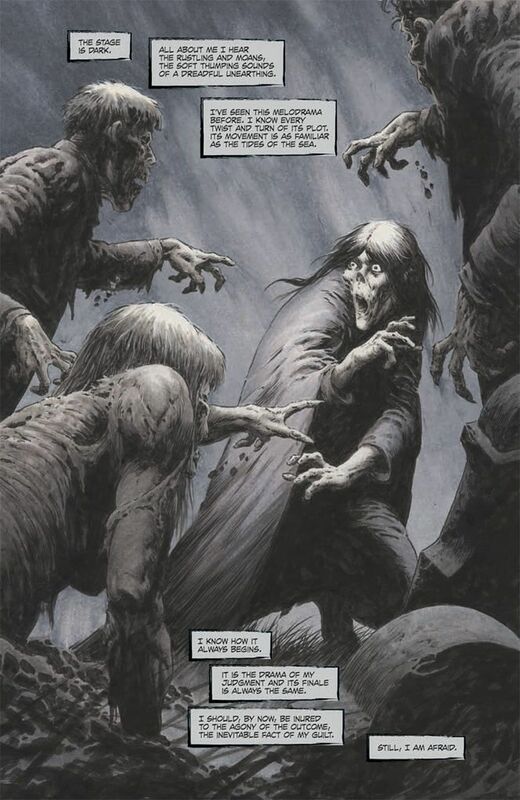 Joining him on this title is the legendary Bernie Wrightson, who has done some incredible art; so much so that Dark Horse previously published a collection of his work from the Creepy comics a few years ago. 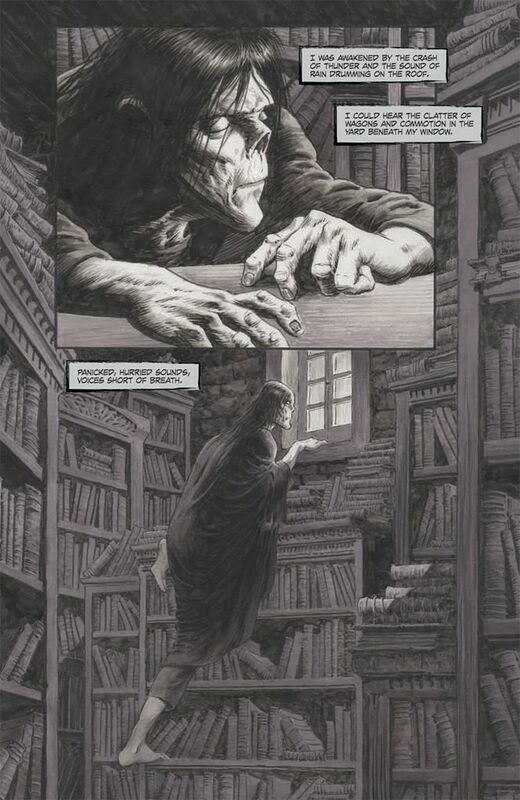 Wrightson is a master and this comic looks amazing. Most of this issue is presented in gorgeous double-page spreads. Wrightson leaves plenty of room to let the art breathe and Niles manages to pack the book with story without covering everything with text. The real treat comes in Ingles' library and workshop. These are blown up in the back of the book to provide you a better look at them, as there is a lot to take in. Picture everything that would be in a mad scientist's workshop and then add a taxidermy studio and rows upon rows of small bones and you're on the right track. 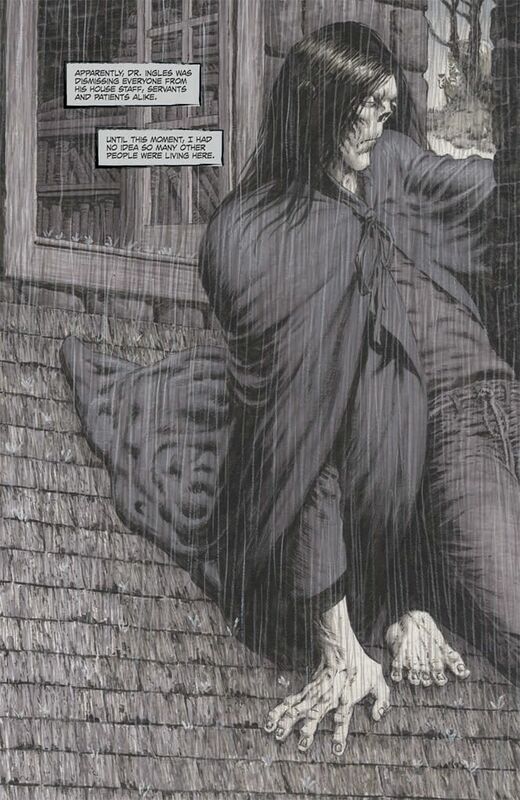 Wrightson does not skimp on this at all. Instead, there is some intricate work with a level of detail that is just not seen in modern day comics. Frankenstein's monster is never conveyed as menacing, even though he's eight feet tall without a nose. Instead, you can feel the weight that this being carries on his shoulders. This guilt has weighed him down to the point where he seems to find it difficult to stand up straight. He's somber and tortured by his past. You feel for him from the first moment he appears on the page. Frankenstein, Alive, Alive! is a brilliant character study providing a take on someone that has been labeled a monster for decades. 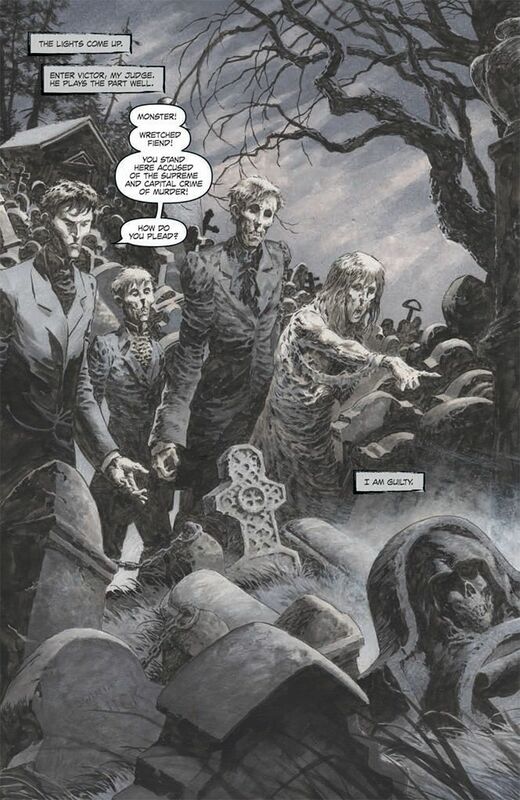 Instead of telling the same old story of this creature mindlessly rampaging at villagers with torches, Niles and Wrightson are providing an emotional look at a misunderstood beast that is searching for his true place in the world. Despite his appearance, humanity is the real monster, considering they brought him back to life and have brought him face to face with this new situation.